If Da Qiao & Xiao Qiao have not played two cards of different colors during their turn, they can place one of their hand cards on their character card immediately before their discard phase. This card is known as a Step. When Da Qiao & Xiao Qiao acquire three Steps, they must discard all of them and choose any male character. Da Qiao & Xiao Qiao cause two units of damage to this character then discard all of this character's equipment cards. If Da Qiao & Xiao Qiao have at least one Step on their character card, they can use "Fantasy" and "Displace." If Da Qiao & Xiao Qiao wish to use "Star Dance" on any given turn, all of the basic, tool, and equipment cards must be of the same color (diamond and heart or spade and club). Each turn is counted separately, so they can use only red cards one turn and black cards the next, for example. "Star Dance" takes place between the action and discard phases. Da Qiao & Xiao Qiao can set aside cards as Steps even if they are victim to Capture or if they do not have any cards to discard. Note that Da Qiao & Xiao Qiao do not have to set aside any cards as Steps for "Star Dance" if they fulfill the requirements of using the ability. However, once they set aside three cards, they must discard all of them and select a male character. If Da Qiao & Xiao Qiao acquire three Steps and there are no male characters in play, they simply discard the three Steps and deal no damage. When Da Qiao & Xiao Qiao target a male character with the offensive component of "Star Dance," they take two units of damage then discard all equipment (in that order). "Fantasy" is Xiao Qiao's power. Whenever she receives damage, she can discard a heart-suited card from her hand and select any character. The damage to Xiao Qiao is prevented and instead dealt to the selected character. The target then draws X cards, X being the difference between their maximum and current health levels after the damage is caused. "Displace" is Da Qiao's power. When she is attacked, it allows her to discard any card and redirect the Attack to any character in her attack range except the player who played it. When Da Qiao & Xiao Qiao use "Fantasy," the source of the damage is not changed - the person who would have been responsible for Da Qiao & Xiao Qiao taking damage is considered to be responsible for the new person taking damage. Da Qiao & Xiao Qiao can pass the damage back to the character that caused them to take damage via "Fantasy." If Da Qiao & Xiao Qiao use "Fantasy" and kill another character, this character does not get to draw cards until they are revived. In addition, if a character is put in this situation is revived, they draw a number of cards that is equal to the number of health points missing after being revived. Da Qiao & Xiao Qiao can use "Displace" by discarding any hand or equipped card. If Da Qiao & Xiao Qiao discard a -1 Horse or weapon, they forfeit the range of the card before they choose a target. "Displace" goes into effect before the weapon effects are applied (e.g. a male character attacking Da Qiao & Xiao Qiao with the Gender Swords must wait to see if they pass the Attack to another female character before applying the weapon effect). Note that unlike Xiao Qiao, Da Qiao & Xiao Qiao do not have "Beauty." They cannot discard spade-suited cards to redirect damage via "Fantasy." "Star Dance" allows Da Qiao & Xiao Qiao to deal two units of direct damage to any male character. 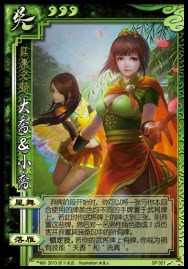 "River Swans" give Da Qiao & Xiao Qiao a couple of defensive ability to help them escape damage outside of their turn. Da Qiao & Xiao Qiao have few options for combating women. "Star Dance" requires Da Qiao & Xiao Qiao to limit what they do during their turn to fulfill the 'only playing one color of card' requirement for three turns in order to deal two units of damage. Other characters can influence the game and deal damage much more quickly. Da Qiao & Xiao Qiao are weak to card destruction. After using them, it is easy to see how costly it can be to have to set aside one of their two drawn cards as a Step. Da Qiao & Xiao Qiao's "Fantasy" is not as powerful as Xiao Qiao's "Fantasy" because they lack "Beauty" and can only use heart-suited cards to pass damage instead of being able to use heart-suited cards and spade-suited cards. Additionally, "Displace" is not nearly as powerful with the addition of more advanced characters that can deal damage without Attacks. As such, Da Qiao & Xiao Qiao are not as strong defensively as they initially seem. After Da Qiao & Xiao Qiao discard three Steps, they no longer have "Beauty" or "Displace." With three units of health and no defensive abilities, they are quite vulnerable. Hua Tuo - Hua Tuo can heal damaged male characters more quickly than Da Qiao & Xiao Qiao can damage them. Zhang Liao/Zhang He/Liu Feng/Gan Ning/Sun Jian - These characters have card destruction abilities and can remove cards from Da Qiao & Xiao Qiao's hand. King Da Qiao & Xiao Qiao are a poor king choice. As the focus of the rebels' attention, they will quickly lose many hand cards and not be able to use their defensive abilities. Additionally, with knowledge of Da Qiao & Xiao Qiao's abilities, there will certainly be some rebels that will choose female characters. Loyalist Da Qiao & Xiao Qiao are a poor loyalist choice. It takes too long for them to significantly influence the game. In the time that they set aside three "Steps," the rebels will be able to deal considerable damage to the king. Rebel Da Qiao & Xiao Qiao are probably best as rebels (assuming the king is a male character), but there are often better choices. Again, it takes too long for them to influence the game. Spy Da Qiao & Xiao Qiao are not the best spy choice. It takes too long for them to sway the game in one way or the other. We try to do our best to give these characters as much credit as we possibly can, but it seems that Da Qiao & Xiao Qiao are not a strong addition to the cast of San Guo Sha. They have a moderately useful offensive ability and a couple of moderately useful defensive abilities, but they really have nothing solid to rely upon in a long game. When using them, store as many heart-suited cards in your hand and try to equip a weapon whenever possible for "Fantasy" and "Displace." Target the male with the most equipment with "Star Dance."